Bell Rock Inn is framed by extraordinary views along the Red Rock Scenic Byway with its sandstone formations and rich red landscape of Arizona's backcountry. Plan a poolside BBQ or entertain friends and family in spacious comfort complete with in-suite fireplaces. 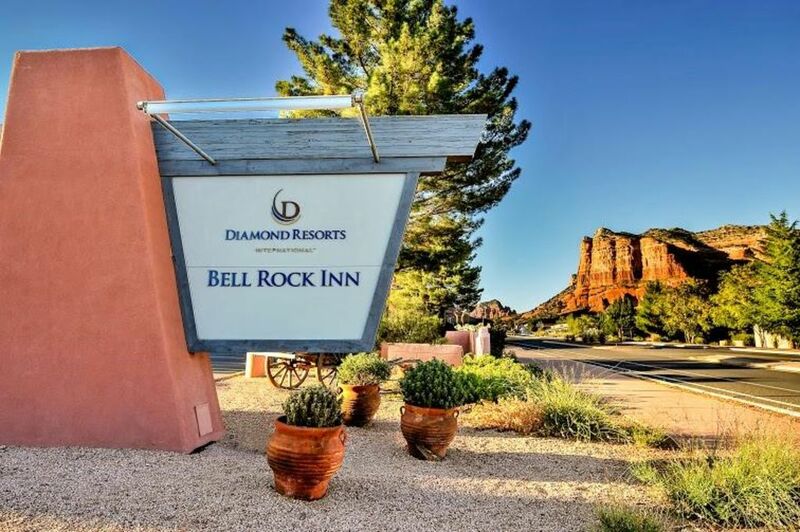 Set amid the natural beauty of Sedona, Arizona, Bell Rock Inn is laidback and friendly and provides easy access to the sights, sounds and wonder of the Coconino National Forest. Activities abound in Sedona and Oak Creek. So whether you are looking for that ultimate hike or extreme trail thrill, you will find a variety of mountains and canyons to explore as well as lakes, creeks and streams to plan a day's worth of excitement from backcountry tours to horseback riding and more. Sedona affords visitors a relaxing oasis and Bell Rock Inn is a retreat nestled in its foothills. RV or motor home parking allowed at this resort - the front desk will advise location at check in. Clean room and pleasant staff. Staff was pleasant and easy to work with. Room was clean, although a little outdated. Bed was a good firmness and plenty of pilllows. The fireplace was a nice touch on a couple of rainy days. We liked being able to cook in the room and the bbq was also great. Apparently there were a number of things in addition to bbq tools that you could check out but there was no listing for those items. Would have been nice to have salt and pepper even though we did bring our own. The sofa bed was very uncomfortable to sit on and the seat cushion kept sliding further out. The only other negative would be a message light on the phone that we could never get to turn off. Had to cover at night so it wasn’t disturbing to sleep. Thank you so much for taking the time to share your recent experience and we are so happy that you enjoyed your stay. The onsite team takes great pride in their property and it is is feedback like this that we learn from and use to improve our services. We look forward to welcoming you back the next time you are in town! I really liked the place but I notice that I was over charged through VRBO. When I checked in on Friday they ran my card for $227.00 for the 2 nights. There was no $100 cleaning fees like VRBO made it seem. Thank you for choosing our property for your stay. We are so happy you enjoyed your stay. The on site team at Bell Rock Inn take great pride in their property and it shows. We welcome the opportunity to host you again the next time you are in town. The decor was somewhat dated but the room was immaculate, the sheets and tiles soft and very white, and the bed very comfortable. The pool and hot tub were great, and the grounds were well cared for. Got a little tired of the push to buy into the resort, but otherwise it was a great place to stay. Our room was clean but shower was old and small much like the hotel in general. The hot tub was only slightly warmer than the pool but also was too cold to be enjoyed for longer than 5 minutes and after a long hike was one of the main reasons we choose this hotel. We used it once in 4 nights - a big disappointment. Would never go back and never recommend this hotel or Diamond Resorts to anyone. Great location. Well maintained property. Hotel Guests: A photo identification, credit card for $100 security deposit and a nightly rate of $14.95 pre taxed resort fee* will be required (cash is not an acceptable form of deposit). *Resort Fee includes WiFi, garden recreational activities, pool and spa, seasonal activities, 24 hour lobby coffee/tea, 24 hour Business Center Computer/Internet access, boarding pass printing and usage of the Outdoor gas grills. This property charges a mandatory resort fee due at check-in. Please check listings for details. Rates subject to change. Click "Book it Now" for rates and availability. Reservations may be cancelled up to 8 days prior to arrival. A cancellation fee of 25% of the reservation will be charged. Cancellation requests made 7 days or less prior to arrival are non-refundable.